Intimidate your friends with the power of The Duke! 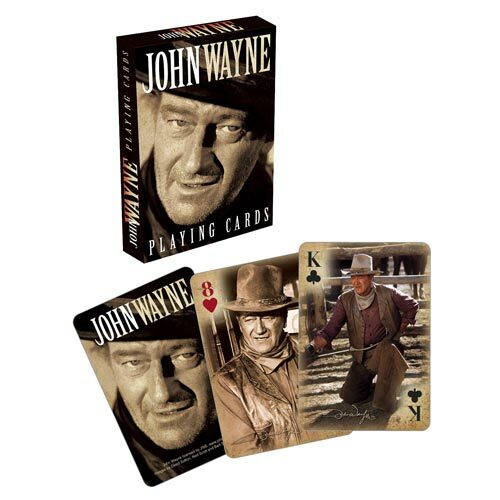 This pack of 52 different John Wayne Playing Cards includes images from your favorite movies! Measuring approximately 2 1/2-inches x 3 1/2-inches with a linen type finish, these cards are great for professional players and fans! Ages 12 and up. The John Wayne Playing Cards can be delivered to the UK, Ireland and Overseas. All the products we sell are authentic and we want you to be fully satisfied with every purchase you make. If the item you receive is not suitable for whatever reason, you can return it within 30 days and you will promptly receive a refund or it can be exchanged for a different item of your choice.